Those of you that recognize the song from the title to this piece, are either old enough to remember Howdy Doody, or are really into nostalgic black and white television. I was humming that little song for a lot of the days projects today. It was time to harvest the buckwheat today. I like to let it grow until it starts to blossom, then till it under and plant the next crop. I let it bloom for a while to let the local insects gather the generous nectar from the lovely white flowers. 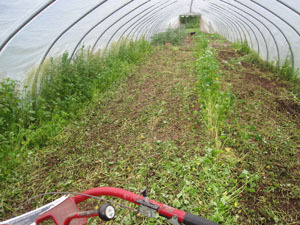 But today was the day to grind the buckwheat into mulch with our trusty Troy Bilt tiller. I was lamenting earlier that there didn’t seem to be any bees working the buckwheat blossoms, which was unusual for us. 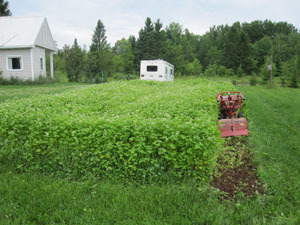 As I went around and around the greenhouse garden with the tiller, I was concentrating the insects into the center row of buckwheat that was left, or “rounding them up.” This is how the song got stuck in my head. I am happy to report there were a few bees in the last row in both gardens, so the bees aren’t completely gone. This entry was posted on Sunday, July 14th, 2013 at 10:24 pm and is filed under Uncategorized. You can follow any responses to this entry through the RSS 2.0 feed. You can leave a response, or trackback from your own site.